The return of #WTF Happened? Written and performed by Actors Rep Artistic Director Erik Abbott, the play was originally commissioned by Théâtre d’Esch and developed by Abbott and Théâtre d’Esch Director Charles Muller as a piece for the Ville de Esch-sur-Alzette’s ‘Nuit de la Culture’ in May, 2017. How did a brash and confrontational billionaire real estate developer and reality television personality bluster his way to the Presidency of the United States? And how has his controversial term in office affected the lives and views of those who supported and support him? Does Donald Trump in the White House represent a new and profound movement in the body politic or is it just another way to increase the value of his brand? Abbott portrays several Trump supporters from a Coal Miner to a member of Congress. The characters, some of whose monologues are based on published interviews with real voters, present a variety of voices and viewpoints—alternately sympathetic, funny, perhaps frightening—and reveal a complex emotional and cultural tapestry examining the Trump effect in a compelling, theatrical way. Inspired by the headlines, #WTF Happened? 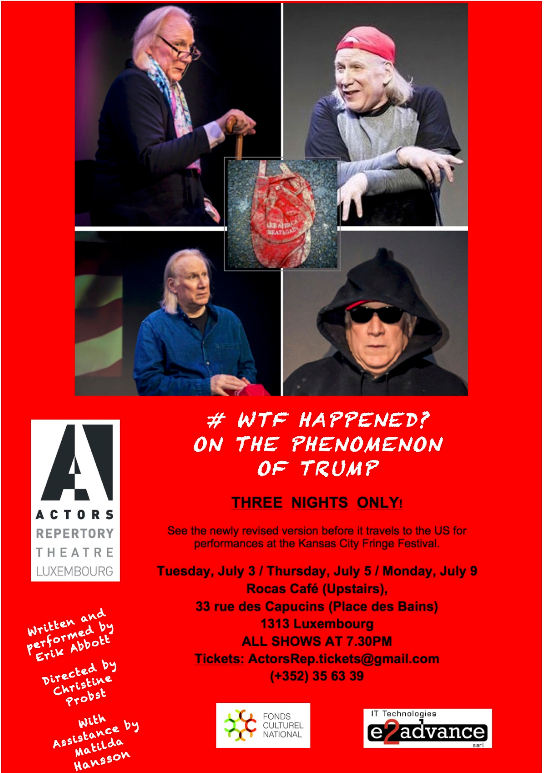 On the Phenomenon of Trump represents another production in Actors Rep’s quest to deliver passionate, thought-provoking, professional English-language theatre for Luxembourg audiences — and, for the first time, to international audiences as well.